The Richmond Football Club has a rich, proud and successful history. In July this year, the Club will celebrate its past with an inaugural Homecoming extravaganza, with the centerpiece a gala event on Saturday, July 11. The event will highlight the Tigers’ football journey so far, which has produced 12 VFA/VFL premierships, and some of the game’s greatest players, administrators and momentous moments. The Club has announced that Tigers great Matthew Richardson will be one of four former players to be inducted into the Hall of Fame, along with the naming of a sixth Richmond Immortal. Entertainment for the night includes decorated singer Natalie Bassingthwaighte and Sam Ludeman Band - The Voice. Imagine a room full of the greatest players to have donned the famous Yellow and Black colours in Richmond Football Club history. Think of Bourke, Bartlett, Roach, Hart, Sheedy, Richardson, Cotchin and Deledio. On July 11 this year, ‘Homecoming’ is your chance to rub shoulders with Tiger royalty, as we celebrate what it means to be Richmond. Homecoming is the biggest celebration the Club has ever staged, where it will pay tribute to the mighty history of one of the most powerful clubs in the competition. And we’re inviting you - the loyal, passionate Tiger Army - to be part of the celebration. Homecoming is an event you won’t want to miss. At Richmond's Homecoming event on July 11, Richmond will add the latest inductees into its Hall of Fame. 42 Tiger players have been inducted into the Hall of Fame, and five have achieved Immortal status. Richmond will celebrate 50 years of the prestigious Jack Dyer Medal at its Homecoming event in July. The Tigers’ coveted Best and Fairest award, which was named the Jack Dyer Medal in 1964, had its 50th winner in 2014 (current captain Trent Cotchin). For more than a decade after it became the Jack Dyer Medal, actual medals were not handed out (until 1977). At Homecoming, the eight players who won the Tigers’ Best and Fairest in those years will be presented with retrospective medals. Richmond pays special tribute to its former players, who left an indelible mark at Tigerland, with a home-game theme for MCG games. The 'Homecoming Hero' is designed to publicly recognise the mighty deeds of those who wore the famous Yellow and Black jumper with such distinction. The Homecoming Hero walks from the centre of the ground to the Punt Road end, where he is acclaimed by the Tiger Army. He then proceeds to kick a ceremonial goal, before signing the ball and giving it to a Richmond fan in the crowd. 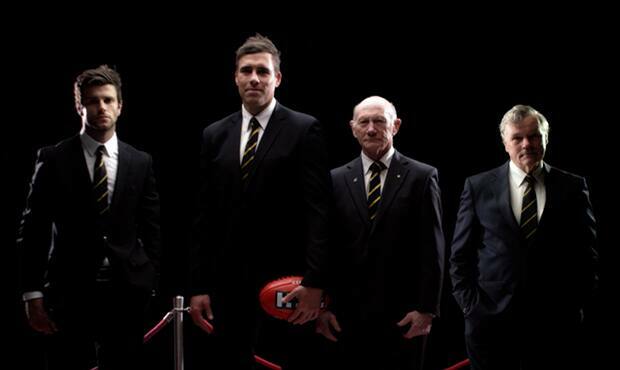 In the lead-up to the 2015 Richmond Homecoming gala event, richmondfc.com.au will pay tribute to its rich history. This season marks 50 years of the Tigers playing at the MCG. Over the years, there have been priceless memories made at the home of football. We've hand picked the most memorable moments. Click on the image below to uncover each moment.